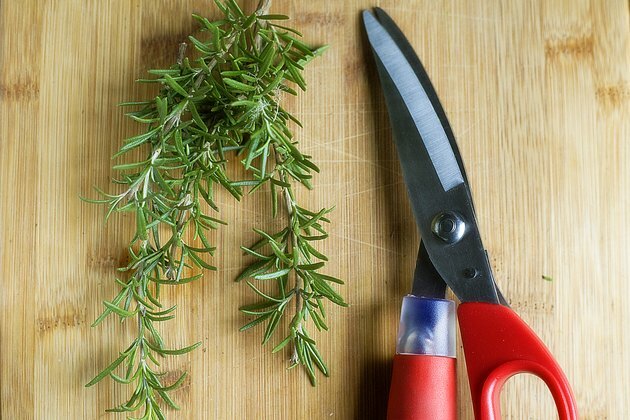 Cut fresh rosemary from your herb garden to use its aromatic leaves in any of your chicken, fish, pork or meat dishes. The leaves this woody-stemmed plant produces are also tasty in breads, butter, soups, sauces and vegetable dishes.The plant yields a wealth of stems, so you can harvest it all season long and still have enough leftover for preserving. 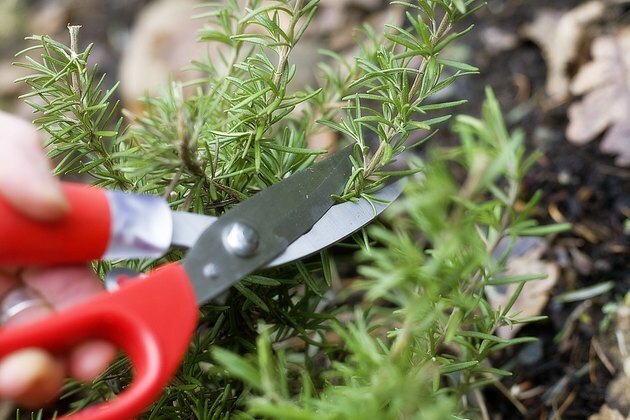 If you understand the when and how of cutting rosemary, you can protect the plant properly and keep it growing healthy herb sprigs all season long. Harvest the rosemary in the morning for the best flavor. 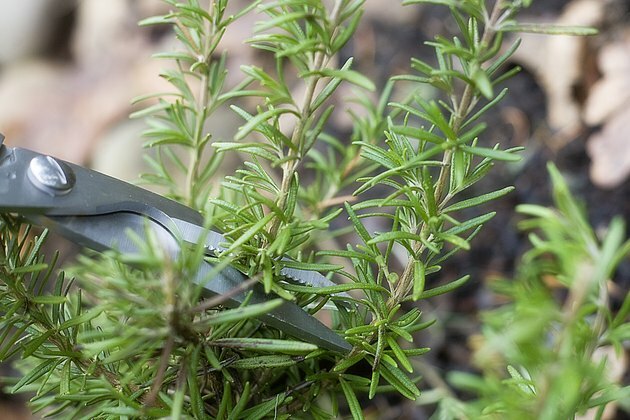 Cut whole rosemary stems, not individual leaves, with a pair of sharp, clean scissors, garden shears or a knife. Cut back the stem completely back to a main or side branch. 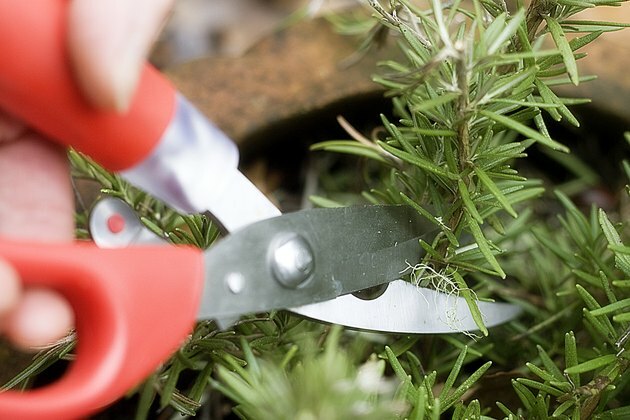 Harvest the stems periodically, even if you don't need the rosemary immediately, to encourage more growth. 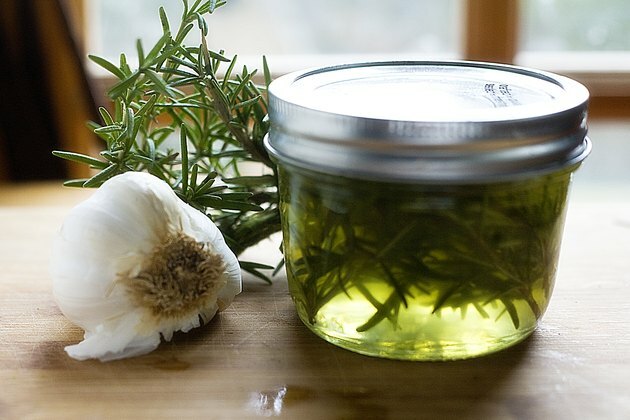 You can always preserve the rosemary for later use. You can harvest fresh rosemary any time throughout the growing season. If you plan to dry the rosemary, harvest it before it starts to bloom. Rosemary flowers are edible and taste good tossed in salads. Hang the rosemary stems upside down in a cool, well ventilated room away from sunlight to dry them. Rub your finger along the stems to strip the leaves from them after they dry. Store dried rosemary in glass jars. Freeze rosemary stems if you prefer or stuff them in bottles of oil or vinegar to preserve.